LASIK eye surgery is a highly successful procedure. The vast majority of operations pass with complete 100% success. Patients see significant changes to their vision for the better. Most are able to drive without the need for corrective lenses and a significant number achieve 20/20 vision. The IntraLase method replaces the traditional use of a microkeratome. This microkeratome is a handheld blade which surgeons used to make the necessary incision for LASIK eye surgery. The great achievement resulting from the IntraLase method is that the LASIK flap is made using pulsing lasers. So no blade is involved in the incision. 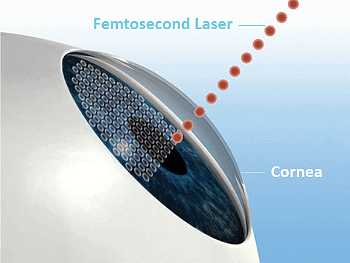 The laser sends pulses of light through your cornea, a quadrillionth of a second per pulse. This creates bubbles just below the surface of your eye. The settings of the laser are made by your surgeon but are computer controlled for precision. This is where the IntraLase method comes into its own. The laser makes an incision which is more precise than the most skilled surgeon using a microkeratome device. The LASIK flap made using the IntraLase laser is individual to you. This not only reduces the chances of a complication; studies have shown that patients who underwent the IntraLase method reported better vision at the end of their surgery. The intralase lasik flap heals faster and can create thinner flaps, thus avoiding LASEK eye surgery for some patients with thin corneas. This blade free incision takes around just 20 seconds per eye to make. Once made, the surgeon simply peels back the flap of corneal tissue and performs the reshaping needed to correct your vision. Once complete, the surgeon is able to replace the flap back into place. The whole LASIK eye procedure takes on average just 10-15 minutes per eye. At this point the healing process begins. Not only is the IntraLase Lasik procedure safe, it is also safer than the traditional method of making the initial incision. Years of research and studies have come to this conclusion. Over a million LASIK procedures have been carried out using the IntraLase Method with few or little side effects. In clinical trials, patients had one eye treated using a microkeratome and another using an IntraLase laser. Patients that stated a preference said they preferred their vision in the eye treated with the Intralase laser. There are also less flap related Intraslse Lasik complications and the reduced possibility of post-operative side effects with Lasik surgery performed using Intralase. If you would like to find out more about LASIK laser eye surgery or any of the other vision correction treatments on offer at Advanced Vision Care and what it can do for your eyesight, then why not call AVC TODAY on 0800 652 4878 and request your free information pack or book your consultation to find out how we can help you.